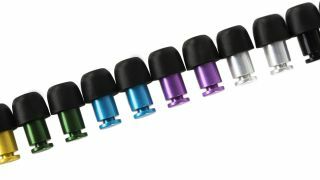 The ISOLATE ear protectors are available in multiple colour options. We know that you love your music, but if you want to keep enjoying it, you need to take care of your ears. You can't take any chances when it comes to your hearing, and that's why Flare Audio has developed its ISOLATE range of ear protectors, which are designed for musicians and gig-goers alike. Unlike other ear plugs, which absorb sound, the ISOLATE ear protectors actually stop noise from entering your ears - including bass frequencies. Their small size means that you can take and use them anywhere, and you can choose from aluminium or titanium options. The metal construction isn't just there to make the ISOLATE ear protectors look nice - although, we think you'll agree that they do - as the extra density helps to stop sound waves from getting through, blocking out the 'subsonic dirge'. This is in contrast to plastic, foam, silicone or maybe even cotton wool options, which aren't as effective and can prevent you from hearing the sounds that you do want to reach your ears. ISOLATE ear protectors are different: you can still hear the music, but through bone conduction. Clarity and definition are retained, and safety is ensured. You can experience all the pleasure associated with loud music and none of the pain, as you create a 'sonic forcefield' of protection. The ISOLATE ear protectors aren't just for music, either. You can use them to block out your partner's snoring, to restore a sense of calm when using public transport, in the workplace or at motor sport events. Don't just take our word for it, though: producer Tony Visconti has called the ISOLATE ear protectors "the best ear plugs I've ever used, great for air travel and very loud concerts!". The ISOLATE ear protectors are currently on Indiegogo. Prices start at £24.99 for the aluminium version and £49.99 for the titanium model, which offers a slightly superior level of isolation thanks to the higher density of the metal. Whichever model you choose, though, you can rest assured that you'll be safe and sound. Long live ears. For more info, please visit Flare Audio.